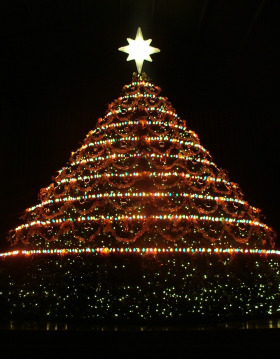 We first began presenting The Living Christmas Tree in 2010. The first year we had a cast of close to 150 & saw more than 60 salvations. In 2011 we had a cast of 200+ and were blessed to see more than 100 salvations. Several gracious individuals have compared these presentations to other well known versions of The Living Christmas Tree. While this is an extreme compliment, we believe the reason for these comparisons is simply the anointing of God. We understand each year that this is an undertaking far beyond our ability, so, as the Holy Spirit reminded us last year “You can do this in your strength and fail miserably or you can depend on My mighty right arm & see My glory! We opted for the latter! CHECK BACK FOR 2018 DATES!! !